The only days we Do NOT pickup are Christmas, Thanksgiving, Fourth of July, Memorial Day and Labor Day. All other holidays except for inclement weather we will be running as usual. B and N provides extremely reliable trash removal service, and we have some of the lowest rates in the area. Our customer retention rate is remarkable because we're so dependable. We offer discount programs that other companies do not, and we focus on our local area. Don't settle for impersonal service from a nationwide company. Reach out to B and N, and we'll make sure you're satisfied with our residential trash service. B and N in Palmyra, New York, offers you a simple way to get rid of all your trash. We provide residential trash pickup in the towns of Fairport, Perinton, Farmington, Penfield, and Pittsford. Our trash removal service originally started back in 1977 to meet the need for this service in our local area. We are a reliable family-owned-and-operated business that provides a valuable service to our community. Call us for full service, curbside service, or trailer rental. A trailer rental is ideal if you're undertaking renovations and need to remove the extra trash. You'll love having your property clean and tidy. The Town(s) we pick up in have requested us to change our service schedule to match theirs to better serve their residents. All recycling days will match service days. If you have any questions, please contact the town by calling (585) 223-5115 or visit their web page at www.perinton.org. 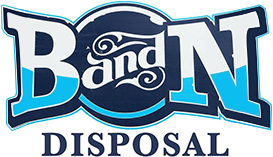 B & N Disposal, Inc.